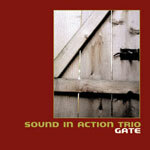 Gate is the second release by the Sound In Action Trio, yet another of multi-instrumentalist and composer Ken Vandermark's many ensembles. Unique among his many intriguing groups, the lineup consists solely of Vandermark and two drummers, each from a very different background. Tim Daisy, the resident drummer in the Vandermark 5, shares duties with drummer Frank Rosaly in saxophonist Dave Rempis' Percussion Quartet. As a seminal member of Sun Ra's Arkestra, Robert Barry has a decade of experience collaborating with multiple percussionists and navigating dense polyrhythms. Much like this group's debut, Design in Time (Delmark, 1999), Gate features a program of originals and covers. Mixing in a selection of classic post-war standards drawn from the songbooks of Albert Ayler, Ed Blackwell, John Coltrane, Eric Dolphy, Herbie Nichols and Sun Ra, Vandermark balances a set dominated by driving, euphoric workouts with a scattered selection of more restrained fare. Two drummers playing full kits in tandem is hardly revolutionary, but the trio's lack of either bass or harmony instrument does pose unique challenges. Fortunately, both percussionists have ample experience in similar settings, making use of attentive listening skills, dynamic sensitivity and immaculate timing. To suggest melodic development, Daisy and Barry conspire to maintain bass pulses and tonal cues. They play with restraint and subtlety on "Medium Cool (for Paul Lovens)" and "Slate (for Paul Lytton)," which spotlight Vandermark's placid clarinet musings. Conversely, the two drummers drive Ed Blackwell's "Togo" along like an eight-limbed beast, furiously undulating while Vandermark stutters out staccato tenor riffs, pneumatically cycling through endless thematic variations. A veteran performer, Vandermark is no stranger to ensembles devoid of traditional harmonic support. Roaming unfettered through these pieces, he veers from mellifluous lyricism to passionate exuberance. While he makes use of a plethora of horns, he concentrates on tenor and baritone saxophone for the album's many boisterous pieces, reserving his clarinet and bass clarinet for a nuanced approach on the few quiet ones. Vandermark takes his muscular, brawny baritone on a resplendent run through Sun Ra's "Enlightenment." His impassioned tenor workout on Coltrane's "One Up, One Down" sidesteps comparisons to the master by avoiding clichés, while Daisy and Barry whip up a maelstrom of rhythmic energy. Despite its unconventional makeup, the Sound In Action Trio demonstrates inventive ways to expand the possibilities of small group improvisation. These players convincingly reimagine standards dependent on solid harmonic development and lyrical exploration with a rollicking polyrhythmic frenzy and dedication to form that never abandons structure. Gate is a testament to Vandermark, Daisy and Barry's improvisational acumen. Track Listing: Horizontal Fall (for Han Bennink); The Prophet; Red Cross (for Elvin Jones); Medium Cool (for Paul Lovens); Enlightenment; Togo; Side Car (for Tony Williams); Slate (for Paul Lytton); One Down, One Up; Love Cry; House Party Starting. Personnel: Ken Vandermark: tenor saxophone, baritone saxophone, clarinet, bass clarinet; Robert Barry: drums; Tim Daisy: drums.